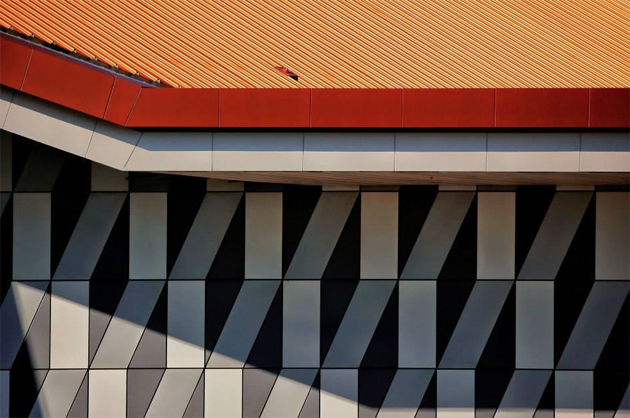 The new roof at Margaret Court Arena may have taken its coloring cue from a copper penny, but the roof found its grandeur by distinctly standing out from the architecture of Melbourne Park and the surrounding city. 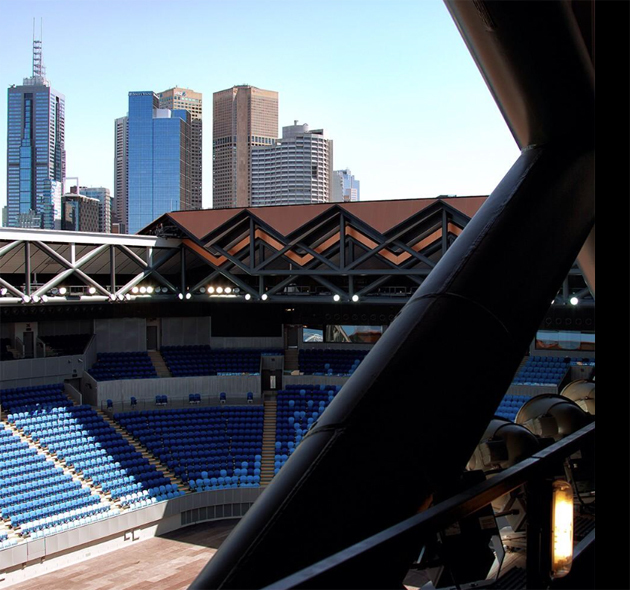 As part of a larger enhancement to the site of the annual January Australian Open, the 7,500-seat Margaret Court Arena received a complete overhaul, officially opening in time for the 2015 Open, and making big brother, Rod Laver Arena, jealous of the copper, pleated retractable roof and remade seating bowl. The pleated roof -- some have said it is akin to the pleats on a traditional tennis skirt, although that was never the original design intention -- reduces the visual bulk of the building while affording the flexibility to fold down all the way to pedestrian level for added shade on the surrounding concourse. While visually striking, the engineering behind the metal roof remained simple. Breslin says they used simple mechanisms to move the roof, ensuring its functionality kept it high enough so tennis balls didn’t hit it and with enough strength to handle concert rigging needs. Using pleats also reduces the structural depth of the roof, reducing visual bulk so the building doesn’t impede on those around it within the sporting park. The move toward a new roof as part of a multi-stage updating of Melbourne Park was driven by the need to both raise revenue options outside of the two-week Grand Slam tournament with the ability to host concerts and other sporting events, but also by the desire to keep out the heat so that tennis can continue. Now the fastest-closing roof in Australia, the pleats fully unfurl in less than five minutes. Along with the fashionable roof, the rest of the building received updates, in part to separate it from the 15,000-seat Rod Laver Arena. With the alignment of the court and the structure of the seating bowl already fixed in place since Margaret Court Arena first opened in 1988, other updating work focused on the back-of-house upgrades to improve the overall experience at all of the tennis venues. The circulation of spectators also changes. In the past, Margaret Court Arena fans were treated to a simple outdoor bowl, while the Rod Laver Arena fans had a concourse that wrapped the stadium with its own food and beverage and restroom facilities. From a ticketing standpoint, managing the two venues separately with some shared amenities was a challenge. “We had to make sure the two could be segregated, so each had their own separate food and beverage and toilets,” Breslin says. Each venue now has its own, personalized retractable roof, so having personalized amenities was a logical step. 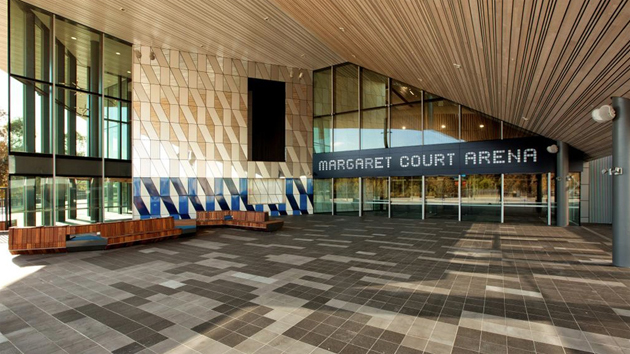 The new entries and concourse of Margaret Court uses glazing so fans can see into the venue and has tennis-centric highlights, such as timber fittings designed to mimic the bounce of a tennis ball. Inside the bowl, crews stripped the seats and increased seat spacing for comfort and added in a few new seats above the old bowl. Overall, capacity decreased in the original bowl, but the additions kept capacity at roughly the same as pre-renovation. 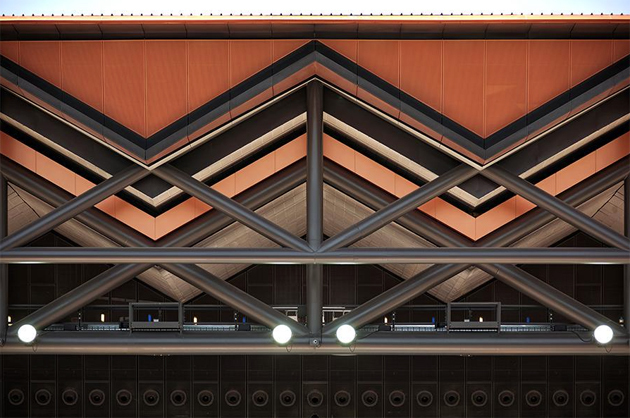 Margaret Court Arena’s new pleated roof will shine in the spotlight for the first time during the 2015 Australian Open. Just like a new penny.